I recently received a death certificate for Amner Caroline Flock. She is my g-g-g grandmother on my maternal line. Amner Caroline and her husband, John are both buried in Enid Cemetery, Enid, Oklahoma. Using the information from their headstone, I ordered death certificates for both of them. I sat down yesterday and proceeded with my document “intake” process. I first scanned the death certificate. I then added a source citation to the meta data for the digital image and filed it under the proper surname. Next, I opened a word document and transcribed the death certificate. This was also saved to the correct surname folder. I also added facts from the death certificate to my genealogy software and linked each to a source citation. 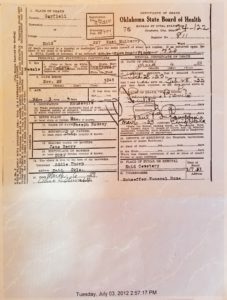 After I transcribed the death certificate, I noticed two items that needed further analysis. The first was the birth date for Amner Caroline. It was listed as 1841 on the death certificate. This did not match with the date of 1840 I have in my software. 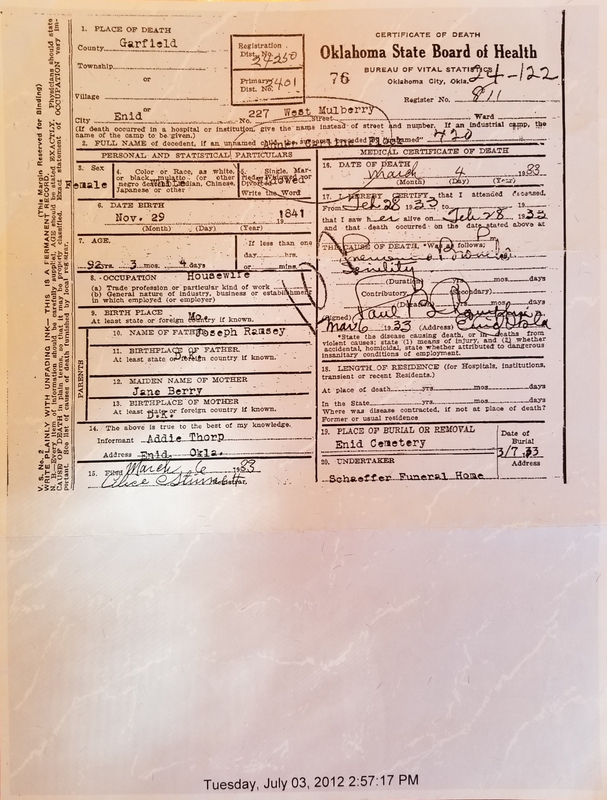 The next box on the death certificate listed that she would have been 92 years, 3 months, 4 days old at death. I also noticed that my genealogy software said Amner Caroline would have been 92 years old with a death date in 1933. I found an online date calculator and input the death date and subtracted the 92 years, 3 months, and 4 days. Sure enough, the answer it calculated was 1840. The person who filled out the death certificate made an error in the birth year. The second item that caught my attention was the informant’s name. 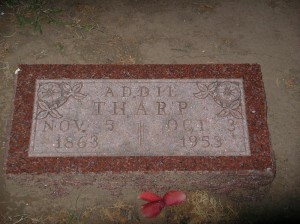 It is listed as Addie Thorp. I wanted to know more about this person and how she would know the particulars of my g-g-g grandmother’s life. My first step was to check Amner Caroline’s 1930 federal census. I did this for two reasons: 1. to check to see if she lived at the same address 3 years earlier and 2. did Addie Thorp live on the same street. To my surprise, Addie was listed as living with her mother, Amner Caroline. This find created another “who is that?” moment. I did not have a daughter named Addie in my research. I do have a daughter named Martha who was born in the same year. I tried a search at ancestry.com for Addie Thorp and Addie Flock. Neither of these resulted in any major finds. Next I tried a general search for the last name Flock (Addie’s maiden name) and a spouse with the last name Thorp. This did not find any great results either. I went back to the 1930 census and looked at it again. I noticed this time that Addie’s last name was transcribed as Tharp. 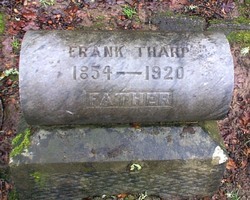 I went back to ancestry.com and did another round of searches for Addie Tharp and the last names Flock and Tharp. BINGO! I found a marriage record index listing in Oregon for Addie Flock and Frank Tharp. I also found online family trees that listed this particular daughter’s name as Adeline Martha Flock. It appears that the same person who filled out the death certificate for Amner Caroline made a second mistake and misspelled Addie’s last name. I need to now order a death certificate for Addie Tharp to confirm her parents. This is still a great find because Addie (Martha) was another woman who seemed to vanish in my family. Finding married female ancestors is always exciting for me. I thought adding this death certificate would only take 15 minutes. I ended up spending much more time than that as I worked through the process and confirmed additional information. It is so important to take the time to analyze a document when you receive it. If you don’t, you just might miss a female relative hiding on the page. The post I wrote last week about Matthias Flock’s family helped me realize some holes in my research on the family. I am not sure how but in the early 2000’s I found information that John Flock might have lived in Enid, Oklahoma at the end of his life. My early research was not always done well. I know now the importance of using citations and research logs! 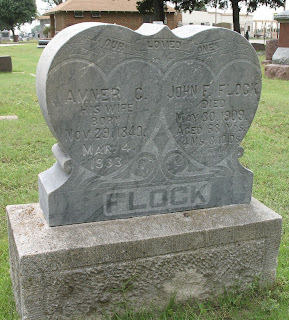 I did not have death information for John F Flock or his wife, Amner Caroline Flock. 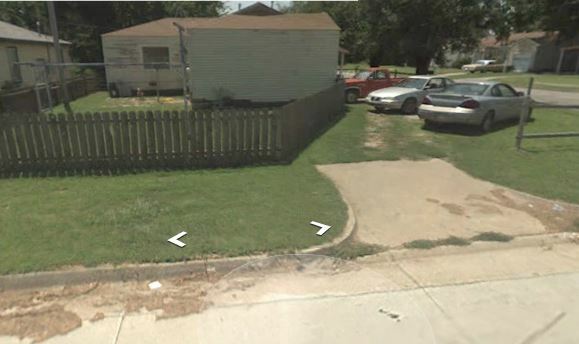 I decided to follow up on the information that I already had about the family and see if I could confirm my earlier research about Enid, Oklahoma. I started by locating Amner Flock in the 1910 Federal Census. She is living in Enid, Oklahoma and listed as widowed. 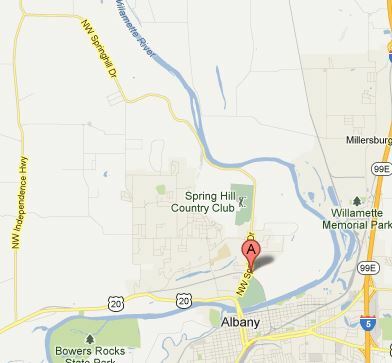 This is a good start, especially since I know that John’s brother and mother are both buried in a nearby county. I then followed up with a search on FindAGrave.com of Enid, Oklahoma. 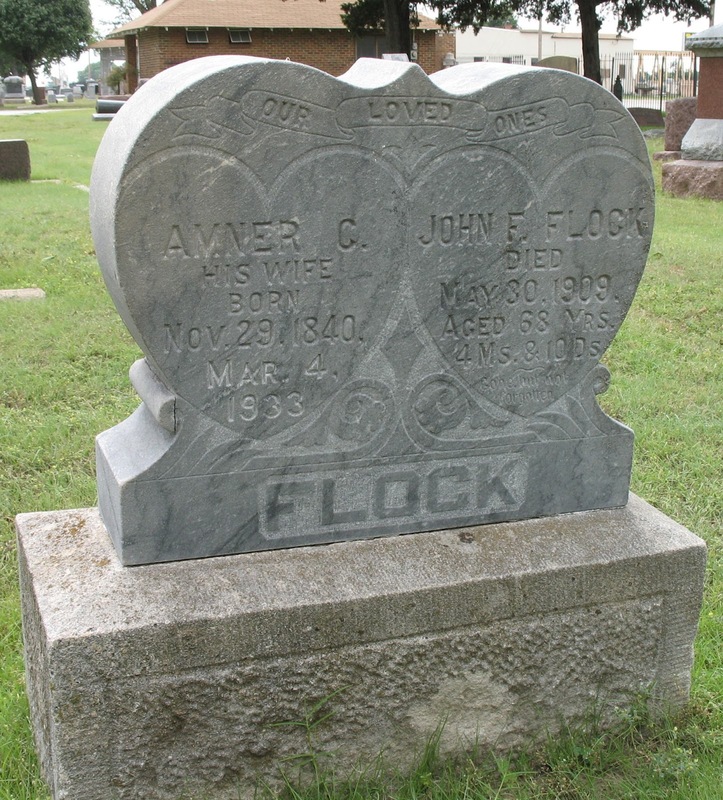 When I searched for Flock in the Enid Cemetery, I found Lillie Flock Janeway. The genealogy hairs on the back of my neck stood up because John and Amner had a daughter named Lillie. The birth date for Lillie on her gravestone matched the information I have found for her. I was unable to find an entry for John and Amner when using the search term Flock. Using Lillie’s FindAGrave page, I requested assistance to find her parents whom I suspected were nearby. 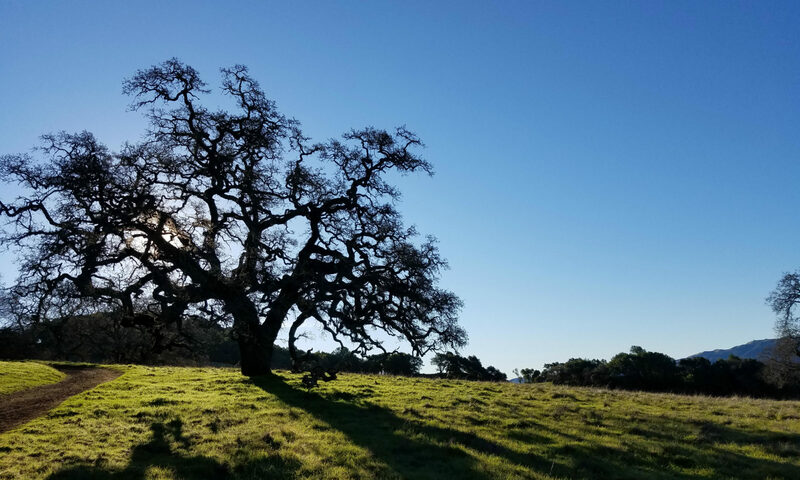 I received an email the next day from a volunteer in the area named David Schram. He let me know that there was in fact a memorial page already set up for John and Amner and that he had gone and taken a picture that morning. He is a genealogy angel! With the memorial numbers I was given, I was able to find the FindAGrave page for John and Amner. I am going to follow up with an email to FindAGrave about my search parameters and how they did not work for something that was really there. A few holes in my research have been filled this week. I also did an updated search at Ancestry.com to see if there was any new information available. There is a picture of John and Amner Flock on Ancestry! I have emailed the person who posted the picture to see if I can use it. Hopefully, I will have another post to show you who my g-g-g-grandparents are!